These new checkout51 offers will go live at 12:00 AM on Thursday, 08/06 and expire at 11:59 PM on Wednesday, 08/12. Members must buy the products in the United States and submit the receipts while the offers are live. Buddig™ Original Deli Meats, Any variety. Items must appear on the same receipt. Kikkoman® Sauces 10 oz bottles or larger. Excludes Kikkoman® Takumi Sauces. Items must appear on the same receipt. Cheez-It® Baked Snack Crackers 5.75 oz. or larger. Items must appear on the same receipt. 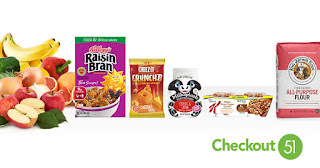 Kellogg's® Raisin Bran® Cereals 13.5 oz or larger. Items must appear on the same receipt. Kellogg's® Special K® Hot Cereals 2 ct. Items must appear on the same receipt. Qi'a Superfood Cereal, Any variety. Kikkoman® Takumi Sauces, Any variety. Weetabix Whole Grain Cereal, Any variety. Mamma Chia products, Any variety. Items must appear on the same receipt. MilkSplash™ Zero Calorie Milk Flavoring, Any variety. Items must appear on the same receipt. Ella's Kitchen® Baby Food products, Offer valid on Ella's Kitchen® baby food products. Excludes all other Ella's Kitchen® or Earth's Best® products. Items must appear on the same receipt. Degree Women MOTIONSENSE Stick or Dry Spray Antiperspirant, Any variety. Excludes Degree Men products and trial and travel size. Degree Men MOTIONSENSE Stick or Dry Spray Antiperspirant, Any variety. Excludes Degree Women products and trial and travel size.